Cricket - My Passion: Are we competitive enough? Sooooooo………after a long time this is my new posting, I was kind of busy these days. Well …… India has done well to beat Pakistan in ODI as well as Test series. I have written my views for the one day series. For test series I like to make some points………. 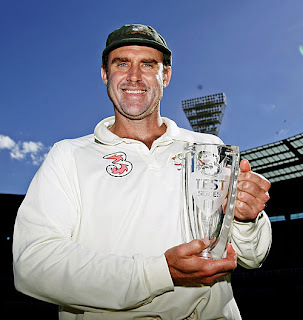 First, is that our new test captain has done an excellent job…….really he has. At the mature age of 38 he was enthusiastic, motivated and energetic. The most important thing was that he has the belief that he gonaa win. Again Ganguly has shown to the world that he still has fire in his belly. May be technically his batting is not as sound as Sachin or Dravid. But, he is passionate for his game and that is what matters. Others Batters has done reasonably well. Bowling was also not especially. We need to find out some who fits in the Kumble’s shoes. Now, coming to the first test of Australian. What to say all things has been said by our captain himself . Our batting was nothing but PATHETIC. Indians were over defensive. Actually the situation was like that, result was bound to come. But our famed Indian batting line up didn’t realize that. The way they were playing, I got the feeling that they want to save the match. How can one save the match by playing DEFENSIVELY for two days. One has to play their natural game. Where was the commitment they showed in famed Eden Garden win, where India won the match instead of subjected to follow on in the first innings. I was not expecting Miracles, what I was expecting was little bit fight. But our famed batting line up surrendered meekly. 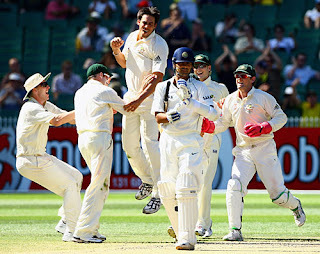 Last time when India visited Australia they managed to draw the series. Because that time our batting was superb. But this time the way things are going, its seems to be complete white wash. Now, I think only Miracle can save INDIA.